Unsurprisingly for a 27-inch monitor, the VX2753 is a bit of a beast. Even though it takes advantage of LED technology, it isn't particularly slim; its dimensions are a rather imposing 25.91 x 18.9 x 8.35-inches. However, while the LED doesn't result in a slimmer model, it has an impact on power consumption. 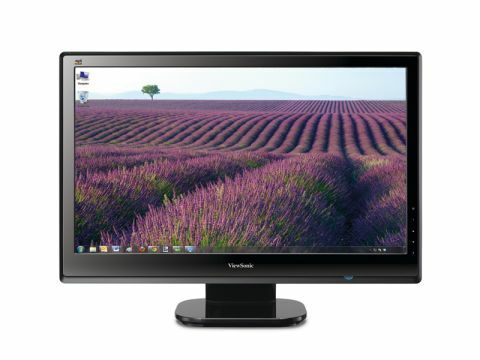 ViewSonic boasts that the VX2753 is around 40 per cent more efficient than comparable 27-inch displays. The large screen and 1,920 x 1,080 resolution make it ideal for watching media. As with other TN panel-based monitors the response time is excellent – just 1ms – which makes it excellent for fast-moving action movies and games. While the VX2753 comes with two HDMI ports and a VGA, it lacks a DVI port. It could be argued that the inclusion of a second HDMI port at the expense of DVI shows a bias towards media playback over office use, but it's annoying if you have a PC that can only output via DVI. The VX2753 has built-in speakers, which sound pretty good and don't suffer from a tinny sound like other small monitor speakers. Image quality isn't as good as some of the other monitors we've tested, with the VX2753 offering rather insipid colour reproduction. Another side effect of using a TN panel is that the viewing angles are rather limited. This problem is partially avoided by the large screen size and by the flexible base, which lets you angle the screen. At just £250, this is a fantastic choice if you're on a budget. You get plenty of screen for your money, and the two HDMI ports make it perfect for use with a Blu-ray player or games console in the bedroom. The image quality isn't the best out there (though it's far from bad), so if you're after a perfect picture you should look elsewhere.